I just finished painting my first set of Brigade Games King Philip's War Pilgrims (this is my first post, but the models are from set #2). I wasn't sure how uniform the men's costume should be. I went for brown and black colors for woodland camouflage. 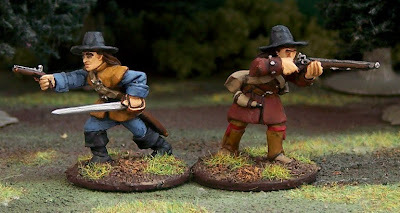 Perhaps the New England milita wore proper uniforms, but these Pilgrim models appear to represent rangers in irregular attire. Indian stockings and moccasins are mixed in with the European clothes, so I presume the variety of colors is appropriate. The blue of the the sword-wielding officer is based on a plate in Osprey's Colonial American troops, 1610-1774, Volume 2. I don't have the book yet, but there is a preview on Google Books. He wears a buff coat made of leather. This was an effective defense against Indian arrows, but not a well aimed musket shot. I had thought the model wore a cloth vest, so I'm glad I figured that out before it was too late. Next I'll be painting the first set of Indians. They're primed and ready to go. After that I'll do Pilgrims set #1. Colonial American Troops, 1610-1774, Volume 2, by René Chartrand. See the Snowshoemen reenactment group for Benjamin Church's "uniforms." Quick question on equipment - Would armed villagers and or town militias - not regular army - be seen carrying the bandoliers of shot with any frequency or is this somethign more common to battlefield troops? I don't know. It seems like those bandoliers were more of an English Civil War thing. I'm only researching 1670s New England. The Osprey books show the militia troops wearing them. Average Joes didn't go hunting, so they probably wouldn't have a musket unless they were in the militia. Average Joes didn't go hunting? Wow, I guess I always just took it for granted that hunting was pretty much a universal requirement for surviving in the New World. Yeah, isn't that fascinating? I just learned that. Only royalty were allowed to hunt in England, so the colonists had no hunting tradition. AND the ultra-conservative Puritans thought it was highly wasteful to spend one's time traipsing about the woods. They would actual hire local Indians to hunt game for them! I think hunting didn't become common until the 3rd generation. Makes sense. So, your armed figs there are explicitely members of the militia. How long does it take to paint one figure and do you use then in some role playing game? I spend about an hour painting a single figure, and the model cleaning, basing and varnishing probably adds another 30 minutes or so. I don't role play, but I think some do use models like these for their pencil and paper games (as a bit of visual interest).